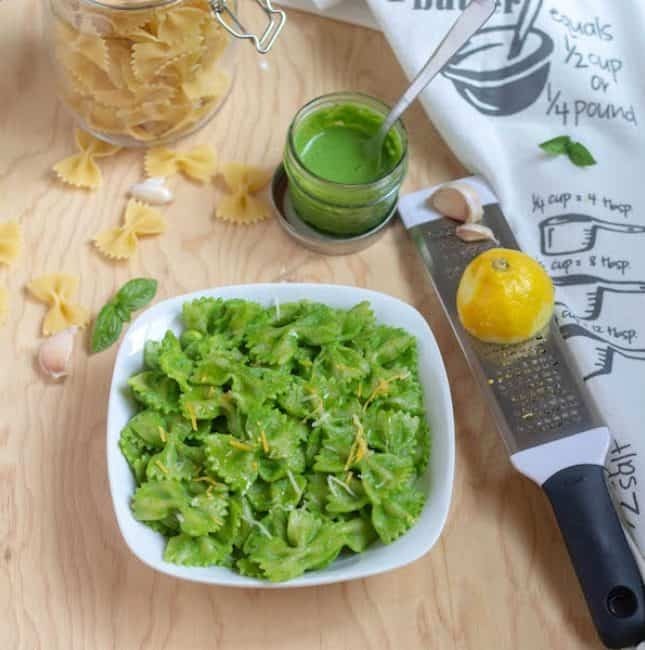 Today I am going to share spinach pesto pasta as a part of the BM theme – Kid’s Delight – Veggies Sneaked in. 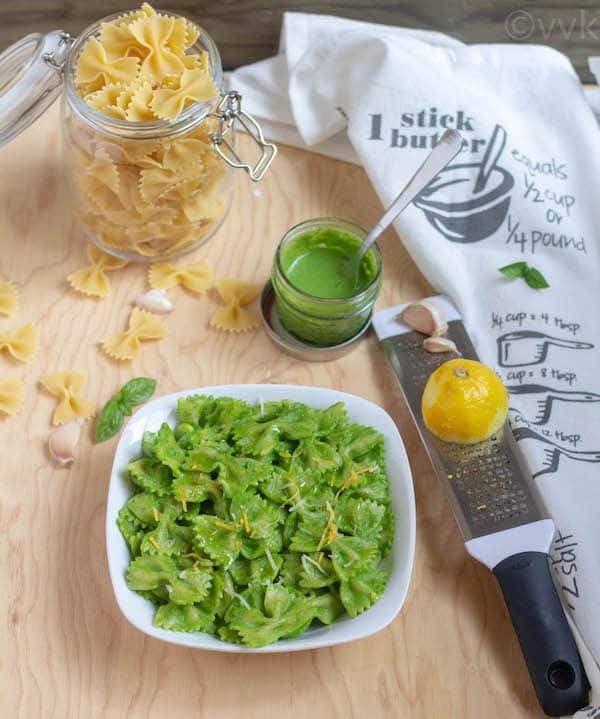 Kiddo loves pesto, and I use it not only for pasta but also in other recipes(see below). From the recipe name you would have guessed what I sneaked in, and yes it is the SPINACH. 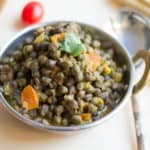 I know nothing can beat the classic basil pesto, but these non-classical pestos will make you go wow as well. For this recipe, I combined spinach and basil along with almonds and pistachios. I added some lemon juice and zest to get that extra zing. Why Almonds Instead of Pine Nuts? I went with almonds in my cilantro pesto recipe, and even in this spinach pesto, I am using almonds as well as pistachios. There is no particular reason for skipping pine nuts. I always have almonds and pistachios in my pantry as we snack on them regularly. Even though I make fresh basil pesto (finally I started to grow my basil in my backyard) during the basil season, pine nuts are rare in my pantry. As we like the taste, I began to use almonds regularly on my pesto. Is Pesto only for Pasta? I would say NO. Here are some non-pasta recipes where I use pesto. 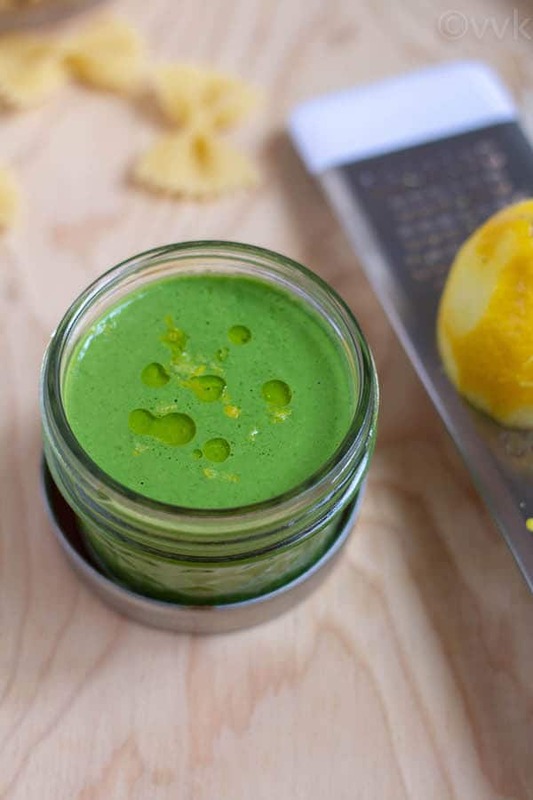 This lemony spinach pesto is a great salad dressing too. Add a dollop of this pesto to your soups, especially tomato soup, and you will be in food heaven for sure. 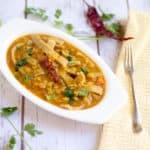 How to Cook Pasta in Instant Pot? As mentioned in my carrot sauce pasta the formula is – cook pasta for half the lowest package cooking time, minus one minute and do a quick pressure release. The farfalle pasta package (I bought the Sprout’s brand pasta) mentioned the cooking time range as 11 to 13 minutes. So I took the lowest range which is 11 and decreased it to 10 to get an even number. Then half of 10 is 5 and then minus one which is 4. So the cooking time for farfalle pasta is just four minutes for the entire packet or only half of it. Now without any further ado, here is the spinach basil pesto recipe. Blanch the almonds and pistachios and peel the skin. I soaked in hot water for about one hour and then peeled the skin off. Add the spinach, basil, blanched nuts, garlic clove, salt, and lemon juice and blend it. Then add the olive oil and make a smooth paste. Finally, add the lemon zest and mix it. As the pesto oxidizes quickly, store it in an air-tight container right away. Add the pasta, water, olive oil, and salt to the inner pot of the IP. Mix them thoroughly. Close the lid and make sure the vent is in the sealing position. When it beeps after four minutes, press the cancel button and then carefully move the vent to the open position and release all the pressure. When the pressure is released, carefully open the lid. Drain the pasta and if required then reserve some starchy water. Set the Instant Pot to Saute mode and add the olive oil. When the oil is hot add the cooked pasta, ground pepper, and the olive oil. Mix it well. Now press the cancel button and set the IP in the Keep Warm mode. Then add about 4 tbsp of the pesto and give it a mix. Finally, add the lemon zest and cheese and serve it hot. Skip the cheese, if you want to keep it vegan. Adjust the salt and pepper as per your preference. I did not follow any ratio with spinach and basil. You can increase or decrease either as per your preference. Lemon zest is entirely optional. Sending this toSrivalli’s Kid’s Delight event, guest hosted by me themed on Veggies Sneaked In. Sneak in some spinach make this delicious vegan lemony pesto with the goodness of almonds and pistachios. 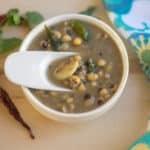 This is such a fantastic recipe Srividhya, love the colour and the composition you have created!..If kids enjoy this food, nothing like it! Spinach pesto paste looks so delicious. NIce color it has got. I love pesto with everything! Love summer time just to make tons of pesto with home grown basil. I have not tried spinach pesto yet. I will give this a try as I have some baby spinach in my refrigerator. 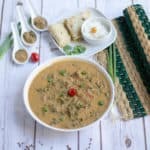 Please do try Sandhya I am sure you will love it. Homegrown is always the best. I don’t use pine nuts in pesto rather using other nuts. and still taste great. 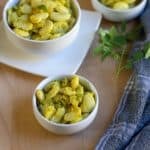 pasta with pesto sauce is a great idea and taste awesome. So true, love pesto pasta anytime. The colour of the pesto is so vibrant because of the spinach used. Using it with pasta, kids would go crazy. Wow ! very vibrant looking pasta. I should try this for sure. Thanks, Harini. Please do try and let me know. 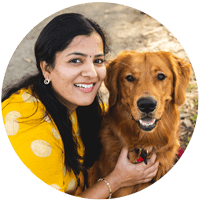 You rock simply with your instant pot and love the way you bring so many dishes with your IP, am sure soon you can write a cookbook for IP lovers Vidhya, seriously.. You have to think about it. Am amazed. 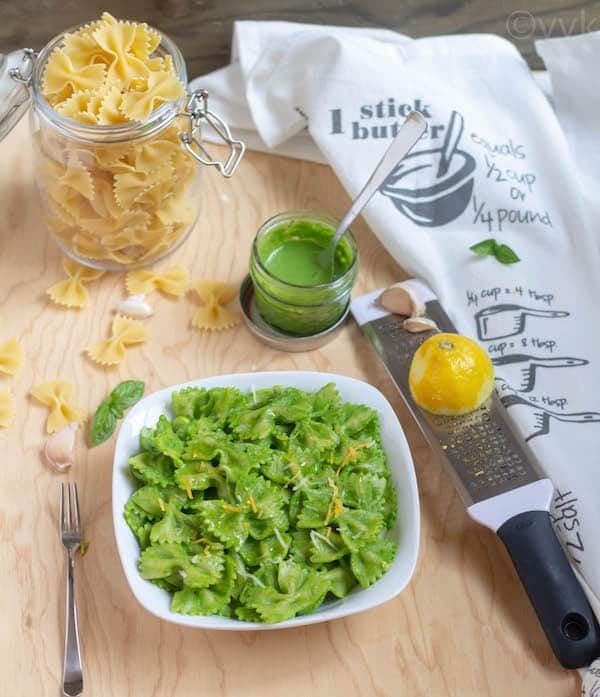 Delicious, how catchy and vibrant those spinach pesto pasta looks, drooling. Pine nuts are expensive, and also go rancid, unlike almonds and pistachios which keep well for long. Even I buy pine nuts only when necessary. 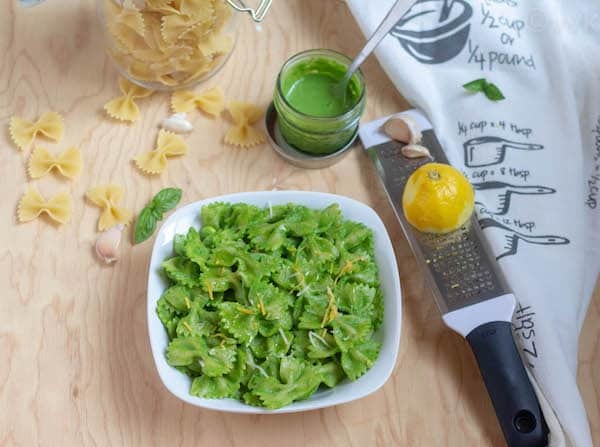 I would love to try the spinach pesto at home, with the pasta… sounds really interesting and flavorful! Oh yeah very true. Thanks a lot Rafeeda. I have not tried pasta in IP. Will keep your pasta cooking in IP formula in mind. I use walnuts instead of pine nuts in my pesto. Spinach pasta is colorful and inviting.